We understand your passion for driving. Whether you drive for the sound, the night lights, performance or your best friend, we know why you drive. That's why Shell Helix Fully Synthetic Motor Oils are made from natural gas and designed for ultimate engine performance, so you can keep your passion for driving alive and Drive On. Description: Shell Helix Fully Synthetics are designed for all types of challenging conditions that put your car’s engine under extreme stress. Here, we see a Jeep driving on the off road, a WRC car driving at speed and a Maserati driving on the extreme 99 turn’s road, whilst explaining why Shell Helix Fully Synthetics allow you to Drive On. We open with a Shell Helix Synthetic Motor Oils title card. Visual Transition: We cut to see a Jeep, struggling through a quick-flowing water-way. Text Displays: Professional driver. Closed road. Do not attempt. Visual Transition: We quickly cut to a shot of a Hyundai WRC Rally car quickly drifting around a corner on a challenging, sandy and rocky looking track. Visual Transition: We quickly cut to a shot of a man driving behind the wheel. In a change of shot we see that he is in a red Maserati sports car driving round a very tight bend. We then cut to an aerial shot of the car to see the winding road on which the Maserati is driving. Visual Transition: We cut to a shot of the back of a Jeep driving through the off-road, surrounded by grass. The next frame then shows a close up of the Jeep’s wheels forcibly driving on the rocky surface. Visual Transition: We cut to see the driver’s view of the road, with his hands on the steering wheel. We then quickly cut back to the wheels of the car driving on the rocky road. Visual Transition: We see the back of the Maserati quickly driving around a tight bed. We cut to a shot of the driver concentrating, and then back to a clip of the Maserati quickly driving around another tight bend. Visual Transition: We cut to a red frame where white and gold gas particles fly in from the left hand side of the screen. When the gas particles reach the centre of the frame, they evolve into the Shell Helix Ultra golden bottle. The golden bottle moves to the right, and from behind it a grey Shell Helix Ultra bottle is revealed. Visual Transition: Finally, we cut to the Maserati car drifting around the corner, before the Shell Pecten is seen in the last frame. Description: The film demonstrates a variety of driving scenarios; on a racetrack, on an open mountain road, and on a tunnel road. We see and hear the motivation behind each driver’s joy when taking to the wheel of their car. One driver enjoys the power of his engine. Another states he drives for the turns, whilst a third driver tells us he drives for the sound of his car. We end on a Shell Helix Motor Oil animation, explaining how this product is designed for ultimate engine performance. We open up on a red BMW speeding and turning on a racetrack. Visual Transition: We cut to the professional driver, helmet on, controlling the car. Visual Transition: We then cut to a more relaxed driver turning his car on an open mountain road. Visual Transition: We quickly cut to a city driver speeding up down a tunnel. Visual Transition: We go back to the professional driver on the racetrack, turning his car. Visual Transition: We go inside the professional driver’s car as we watch him turn the wheel on the car. The driver goes around a corner in front of watching spectators and then drives towards the camera as red and white smoke appears behind the car. 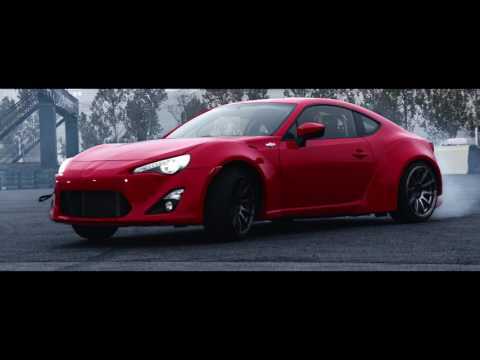 VO: Whether it’s for the sound or the power, we understand why you drive. Visual Transition: We then cut to a red background, as a ‘mist’ of natural gas quickly forms the shape of a bottle of Shell Helix Ultra Motor Oil. VO: Shell Helix fully synthetic motor oils, made for natural gas. Designed for ultimate engine performance. Visual Transition: Finally, we cut to the same red vehicle we’ve seen on the film drive across the screen through a tunnel, before the Shell Pecten is seen in the last frame. Description: Shell Helix Fully Synthetics are designed for all types of challenging conditions that put your car’s engine under extreme stress. Here, we see the ultimate test of performance. A Maserati is driving up China’s 99 Turns Road – one of the toughest roads in the world. Visual Transition: We see a man, standing behind his red sports car parked at the bridge. We can see an epic landscape in front of him. The camera very slowly pans towards him. Visual Transition: We cut to see the face of the man. He is looking pensively into the distance. Audio: I live to drive. It’s in my DNA. Visual Transition: We cut to a dramatic view of tree covered mountains surrounded by whispy clouds. The Shell Helix logo quickly fades into the clip. VO: It’s what brought me here. Visual Transition: We see an aerial view of a dramatic, winding road, cut into the side of the mountains. Visual Transition: We cut to see what looks like the beginning of the mountain road from the inside of the car, as if the driver. We see a man wearing a red jacket and speaking into a walkie talkie. He has a Shell Helix DRIVE ON sign standing in front of him. 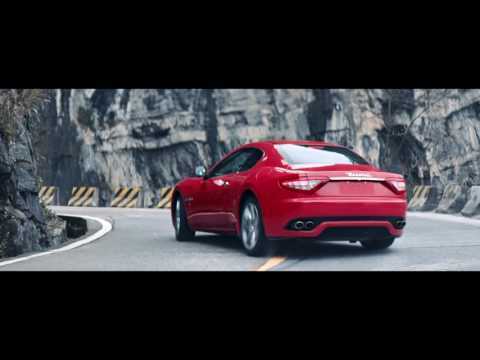 Visual Transition: We cut to a low-down clip of the Maserati taking off from static. Audio: We hear a clear sound of the car’s engine as it takes off. Copy: Professional driver. Closed road. Do not attempt. 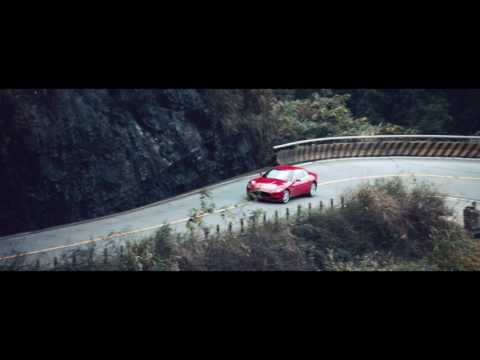 Visual Transition: We cut to another dramatic aerial clip of the winding mountain road. VO: The road of 99 turns. One of the most amazing roads in the world. Visual Transition: We cut to a clip of the car alloys, spinning quickly as the car drives. Visual Transition: We cut to an aerial view of the car quickly and easily driving round a tight bend in the mountain road. We then cut to the back of the car as it tackles the corner. Visual Transition: We see a distant side view of the car as it approaches a tight corner. We quickly cut to a close up view of the front wheel as it tackles the corner. Visual Transition: We cut to a frame of the driver behind the wheel. We pan out to see an aerial shot of the Maserati, before quickly cutting in to a visual of the exhaust pipes. Visual Transition: We see the Maserati coming out of a corner. We then cut to an aerial shot of the extreme and winding 99 Turns road. We quickly cut to a shot of the car from behind and above driving round a corner. Visual Transition: We see a close up of the cars back wheel. We then see the car emerging round a bend behind some greenery. We cut to a close up of the wheels. Visual Transition: We view the car driving round an uphill bend from low down. We then cut to a clip looking down on the car from the road above, over some greenery, as it speeds past on the road below. Visual Transition: We see the driver at the wheel. We cut to a shot of the car driving towards the camera, and quickly transition to a shot of the car from behind entering a tunnel – as if to show it has just sped past the camera. We then see the car driving through the tunnel with headlights on. Visual Transition: The screen goes black. We see light flares moving across the screen to represent the headlights of the car. We see a close up of a drop of water falling to the ground as see it splash. Visual Transition: We see the car speeding out of the tunnel, round a bend and up the hill. We see shots of the car and driver as they ascend towards the top of Tianmen mountain. We see an aerial shot of the car from directly above, showing the extremely winding road. Visual transition: We see an aerial view of us looking onto the car climbing towards the top of the mountain, surrounded by views of the tree covered, jutting landscape. Visual transition: We then pan towards the car as it drives around the final corner on the mountain. The camera fly’s over the car, leaving the mountain road behind, and showing the views of the cityscape below. Shell Helix Ultra helps to power, protect and cool the Scuderia Ferrari powerunit. Recognized as one of the most successful teams in Formula One™ history and one of the world’s most iconic automotive brands, Shell Helix Ultra is a critical part of the Innovation Partnership with Ferrari on both the track and the road. In fact, the lubricants found in the Scuderia Ferrari’s high performance racing engines powerunit shares many of the same building blocks (base oils and additives) as those found in the Shell Helix Ultra with PurePlus Technology available to road-going customers around the world. Plus, every GT road car that to leaves the Ferrari factory is filled with Shell Helix Ultra Synthetic motor oils. A shared passion for driving and performance. BMW Motorsport and Shell Helix Ultra have a Premium Technology Partnership, and a winning one at that. Shell Helix Ultra scientists work closely with BMW Motorsport engineers to better fit the benefits of PurePlus Technology into the BMW M4 DTM car, ensuring the maximum performance of the engine unit in every race*. Ultimately to benefit the motorist on the road, because it enables Shell Helix Ultra to test motor oils in extreme conditions. *While Shell Helix Ultra with PurePlus Technology motor oils for the racetrack and the road share the same technology platform, the racing formulation is customised to meet the extreme racing conditions. Shell and Hyundai have been global partners since 2005, with a global aftermarket agreement in place across 67 markets worldwide. As Title Sponsor and Technical Partner, Shell aims to co-engineer a winning edge to Hyundai Motorsport as it competes at the highest level of global rallying at the World Rally Championships (WRC). The WRC series provides the ideal environment to showcase the quality of Shell Helix Ultra with PurePlus Technology. Set in over 13 countries, it challenges the cars to compete in extreme environments - from snow and ice to gravel and asphalt in temperatures ranging from -30°C to +40°C. Due to the conditions the car is put through, using reliable products that lubricate and protect the engine without a loss in power or performance is vital to the team’s results. Shell Helix Ultra partners with Maserati because they are both made for the same type of people, who love their car and want the very best performance. Shell PurePlus Technology protects the horsepower and maintains the performance of the Italian hot-blooded cars like the day they left the factory. That's why the engine of every Maserati leaving the production line is filled with Shell Helix Ultra Maserati, so they can Drive On. Shell Helix semi-synthetic or ‘synthetic technology’ oils make use of both synthetic and mineral base stocks to achieve higher performance levels than can be formulated from mineral oils alone.